Chad and Karen Heringer created the popular Steveston butcher shop, that bears their name, but have sold it to Vancouver business Windsor Meats, to enable them to retire. The new owners promise to keep all that’s great. 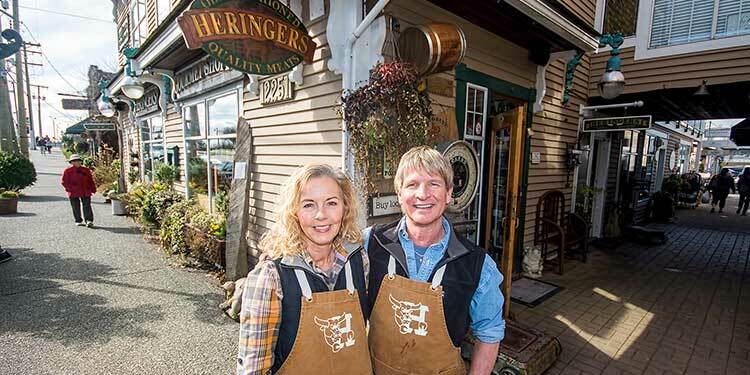 It will still be called Heringers—the butcher shop and more in Steveston—but Chad and Karen Heringer will no longer be there. After 28 years, they will be enjoying what they are calling their, “Freedom 55,” hitting the road with their airstream trailer and enjoying retirement. They have sold their shop and all that goes with it, including their recipes. The new owners plan to keep the shop much the same, “perhaps adding a few things too,” Karen says. “We are so grateful for the rare opportunity we have had to share our lives and food passions with so many people,” she says. The shop’s Heringers name and phone number will not change as the new owners move in.